ഹരിത പെരുമാറ്റച്ചട്ടം നടപ്പിലാക്കുന്നതുമായി ബന്ധപ്പെട്ട് അടൂർ ഗവ .പോളിടെക്‌നിക്‌ കോളേജിൽ ജൂൺ രണ്ടാം തീയതി ഭൂമിത്രസേനയുടേയും നാഷണൽ സർവീസ് സ്കീമിന്റെയും ആഭിമുഖ്യത്തിൽ ബോധവത്കരണ ക്ലാസും ശുചീകരണപ്രവർത്തനങ്ങളും നടന്നു . Government Polytechnic College, Adoor is one of the major Technical institutions in Pathanamthitta district situated at Manakkala, Adoor. It functions along with other educational institutions in Central Travancore, which carries a creditable record of supplying several technicians, technologists, architects and a group of talented persons to the nation. Government Polytechnic College, Adoor was established in the year 1994 which came an upgradation of a Technical High School, which had been functioning here since 1964. Located in a rural area on a hillock , the scenic beauty and serenity of the surroundings appears most suited for academic pursuits. The institution stands less than half kilometers from Manakkala junction, which is only 4 km away from Adoor. Regular bus services on this major route between Adoor and Sasthamcotta make journey to the College quite an easy thing. At present the institution is in a campus of 11.56 acres at Manakkala,ADOOR. This institution offers three year diploma Programmes in three major disciplines of Engineering / Technology ( Mechanical Engg. , Polymer Technology and Architecture ) under the Directorate of Technical Education, Govt. of Kerala. The institution is approved by the ALL INDIA COUNCIL FOR TECHNICAL EDUCATION, NEW DELHI. 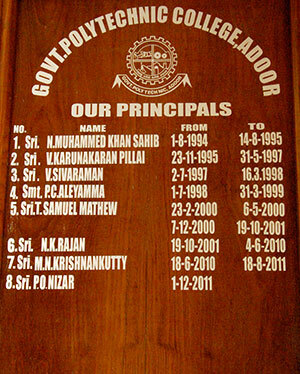 Three staff members are appointed for executing the Right to Information Act,2005 in this institution. The Head of Section in Mechanical Engg. sri. Asok Kumar P. is the Public Information Officer.Senior clerk is the Asst. Information Officer and the Moderator handling the inward section. TO DEVELOP THE INSTITUTE INTO A CENTER OF EXCELLENCE IN PROFESSIONAL AND TECHNICAL EDUCATION AND TO TRANSFORM EVERY STUDENT INTO INDUSTRIAL LEADERS. TO SERVE THE NATION BY NURTURING AND DEVELOPING PROFESSIONAL TECHNOCRATS WHO WOULD CONTRIBUTE TO NATION BUILDING.TO PROVIDE INDUSTRY ORIENTED QUALITY TECHNICAL EDUCATION. TO MEET THE EVER CHANGING AND CHALLENGING NEEDS OF INDUSTRY, BUSINESS, SERVICE SECTOR AND SOCIETY AT LARGE. Providing better placement through continuous interaction with industry and the alumni. To impart quality education with values and equip youth to learn and apply technology in service to humanity. To continuously train and equip faculties with latest developments in technology through faculty development programs so as to impart value education to students. Situated on a serene hillock near Adoor, our college provides excellent training to the aspirants of Diploma in Polytechnic stream. Our aim is to impart value-embedded quality technical education which benefits the individual, society at large and the nation as a whole. We see in the eyes of our students the same glow as that of a useful finished product that comes out of a lathe. In this process of moulding committed and competent technocrats we are supported by the teaching and non-teaching staff and parents. We also make use of the most advanced labs and workshops and modern multimedia classrooms. Our students have access to big industries through out India and abroad. We equip our students with various Co-curricular and extracurricular activities that improve their creativity, inter-personal skills and personality. We are committed to provide our students with the best learning experience and training. This website will give you more information about our college. We hope you will find it useful thus making us serve you better. It gives great pleasure to be part of the process of making this website. This is an opportunity to reflect ourselves, our progress and our achievement. It also shares information among students, parents and staff. We take every effort to provide accurate information on this website. We do invite suggestions for the improvement in this accomplishment. Our sincere thanks to the principal, staff, students and the outsourcing team who made this venture a reality.